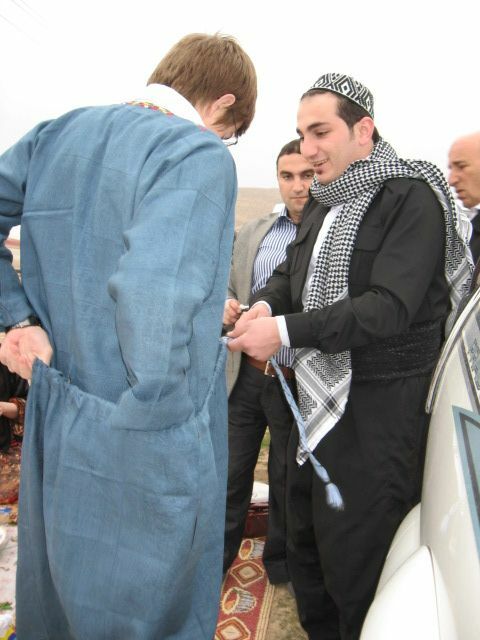 I’ll always remember my first Newroz in Kurdistan as the time a Kurd literally gave me the shirt off his back (and his baggy trousers too!). My wife and I were picnicking with the family of one of our students. Among the many cousins, aunts, uncles, and others, there was a grandfather (or perhaps he was a great uncle) with a constant grin on his face and a mischievous twinkle in his eye. He knew a smattering of English phrases, and decided to make himself my bosom companion for the day. Before long, he got around to remarking what a shame it was that my wife had come wearing Kurdish clothes while I had none. Wouldn’t we make a more handsome pair if dressed to match? That’s when he had the idea. He started speaking very animatedly to everyone, and whatever he said was met with great laughter and enthusiastic agreement. Then he started to disrobe. Right here I should point out that Kurdish men often wear slacks and a button-down shirts underneath their traditional garments, especially on a chilly day like that one. As it began to dawn on me what was happening, my student’s father confirmed in English that I must put these clothes on immediately. At this point the entire family was gathered round with cameras at the ready. What else could I do but be a good sport and play along? In a matter of minutes, they had transformed me from Amriki to Kurdi, complete with elaborate cummerbund and tribal headgear. The change was loudly applauded and many, many pictures were taken. I never expected to be the day’s featured entertainment, but now my first Newroz is one of my favorite memories. 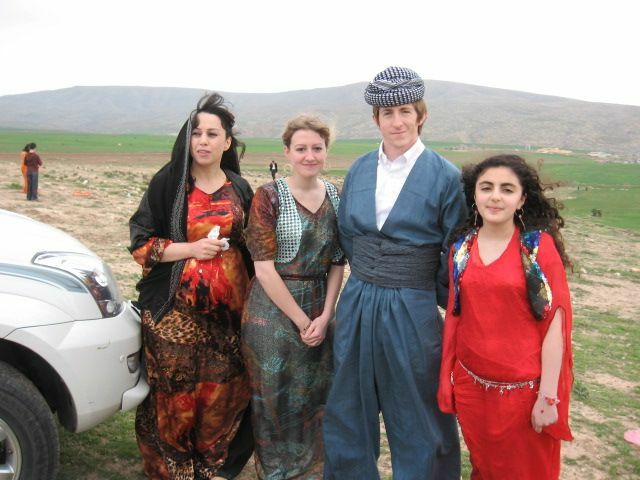 And that family later presented me with my very own set of Kurdish clothes, which I will always cherish. To see a video of a Newroz street festival see our Facebook page!